The core of Fighting games has pretty much stayed the same since the days of Street Fighter and Mortal Kombat back in my early days of fisticuffs, with the only big change now being the games looking better than they ever have before. Take the last Mortal Kombat game that took fatalities to another level, with Injustice 2 taking what Gods Among Us did so well and just looking better than it ever has before. I'm no superhero fan or fighting fanatic, but as a gamer, I can appreciate what this genre adds to the gaming landscape, with certain series going on longer than I have been a gamer. Injustice is still in the early years of its long shelf life, but when a game offers things like Batman, Superman, Joker and much more, this will always be a series that fans will happily pre-order and be excited about upon every release. The first thing that hit me with Injustice 2 was just the amount of modes and things to do, with my mind thinking it would be nothing more than a simple fighting game that had a basic story and online play to mess about on. 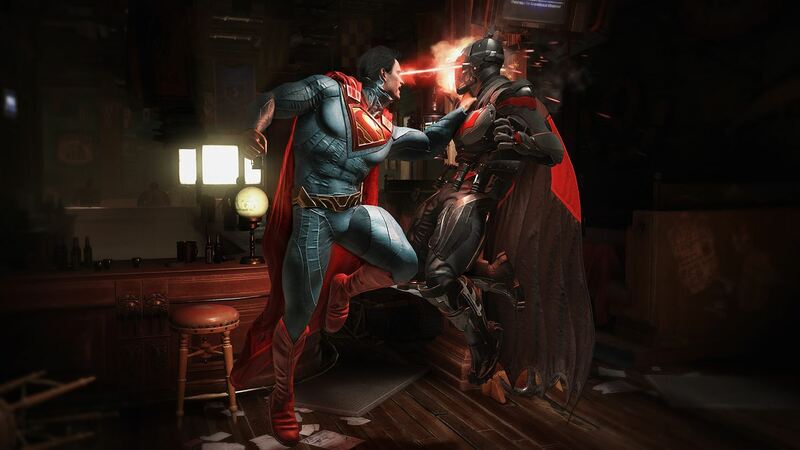 Injustice 2 will offer a mode for both the offline and online player, the online guy not being scared of having his face smashed in by the many pros already out there waiting for them in the lobbies. With the offline guy being able to dabble in more than just the story and local fights with friends too. The story itself kind of gave me what I expected. That being a story very much about stopping the bad guy while fights leading up to it that don't really make much sense as they are set up. You go to an area, that guy appears, you fight. It's pretty much that for around 12 chapters, with some of them having an option of which fighter you will use to take on this opponent standing in front of you. To fully complete the story you will need to play through it twice, but you can go back to a chapter after finishing it off once and choosing the other fighter who was also available to you at that time. Other than that the story is very predictable. It did a good job of entertaining me for the few hours it took to finish it. So it's not all bad. Just don't go in expecting the story of the century. Other modes in the single player tab on the menu are of course single fight (no explanation needed here I hope), The Multiverse, practice, and also tutorial. The Multiverse is the one that I only need to explain here, with this mode being a place where a bunch of planets (all differing in difficulty) are available to you to try and gain yourself some loot boxes or rare gear. Planets come and go, with each one having a time limit on how long they will be available for, with this being minutes, hours, days, or even weeks. From time to time these matches also throw in a level modifier too, with ones that I had being a saw coming out of the floor and also falling asleep every now and then (zzz signs above head and unable to move). This just mixes things up a little and does a great job of breaking away from things just being a standard match all the time. Easily the standout mode for me though has been the AI Battle Simulator, a mode in which you choose your best three fighters to go head to head with random players or friends who fight it out without you having to touch a button. You can do this while offline and come back the next time you load up the game and watch the fights that your characters tried to win. Just a good way to earn loot and not having to fight. In terms of Multiplayer, well much like SP this is catered for very well too with the likes of private, ranked, unranked matches, rooms, and Guilds being somewhere where you team up with others to complete daily and weekly challenges, and also the Multiverse that the Guild lobby has too. Finally, I need to talk about how good the game looks and plays, with the controls system and graphics both doing a great job of doing what they're supposed to do. The combat system is easy to pick up, even for me and my fat fingers. Of course the players that put more time in are going to be way better than you online when you face them, but in terms of picking it up and playing as a guy who doesn't play these very often, I still found myself having fun and being half decent at the combat. Much like Mortal Kombat we also see these special power moves that are activated when pressing both the LT + RT buttons when you meter is full up. Some of these are really cool to watch and never become dull when pulling them out. It's a shame though that some characters don't have a big move like some of the bigger characters do in the game, as when you see The Flash running his opponents through time, to then seeing Cheetah simply jumping about a bit for her move, it certainly feels like the bigger guys got more love. Stage transitions are cool too, with you doing a hard punch on a set side of the screen to see your opponent flying through walls or floors and meeting up to continue the fight in another area. 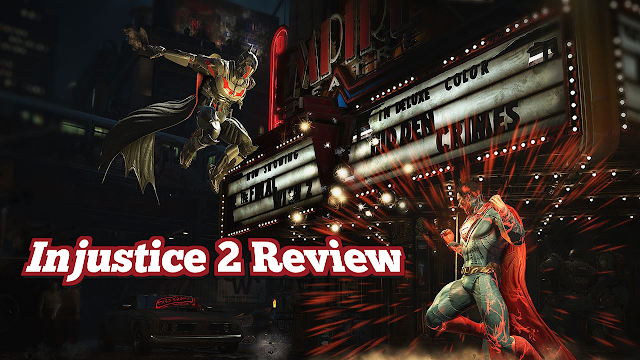 Overall: Injustice 2 ticks all the right boxes of what one would expect from both an offline and online fighting game. Looks beautiful at times. And with a crap load of modes to mess about with, this is one fighting game that isn't over with for the crap online player once the story is done with.